After 2 days of travel I finally got back here on thursday from my TNNA adventure, and jet lag and heat exhaustion are doing it's worst. Sleep though has started to come round, and after what feels like weeks of only getting a few hours per night, a solid 12 hours were managed last night and already I'm starting to feel vaguely human again. 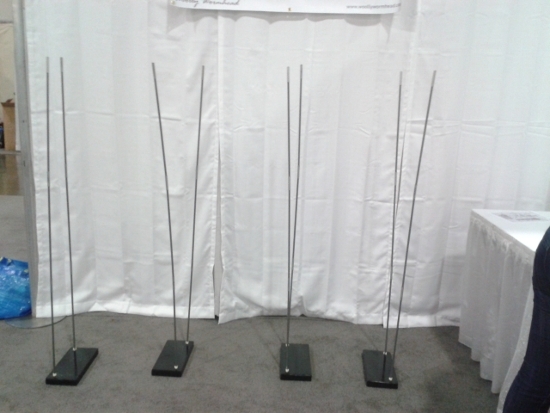 There's a lot to share from this summer's show, and I thought I'd start with my booth. I've exhibited a lot over the years, at various shows and art exhibitions, but never at TNNA. Once I'd got the gist of how the set up works there from the Designers Forums, I set about finalising the last few details. My display had been planned for the best part of a year and seeing it all come together on the day was pretty cool. All of my display materials, to fill the 10ft x 10ft space, came in 2 suitcases. The smaller red one is actually Ruth's (Rock and Purl) - my 2nd one was slightly larger to allow me to pack some clothes and we used the smaller one to transport everything on set up day. 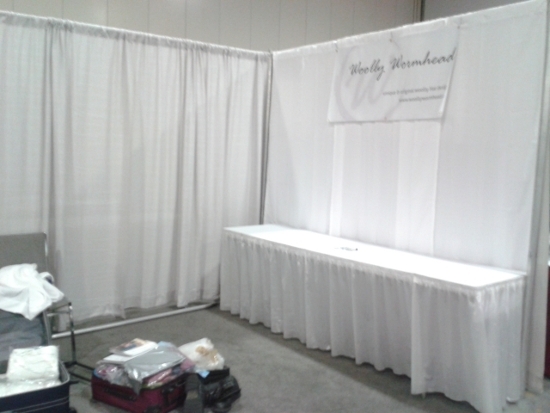 Ruth and I shared a room, and she was a fantastic help at setting up my booth. We started with the drapes (curtains) first. The conference centre had a grey colour theme this year and I very much needed white. Once the drapes were up, we could start uncurling the banners, as seen on the right of the photo. The table was hired and came ready draped... it's how they do things over there, every last item, right down to the plug sockets, are ordered and hired individually and it can get pretty costly if you're not careful. Knowing that a) hiring display gets redonkulously expensive and b) knowing I was coming from the other side of the Atlantic with a maximum cargo allowance of 2 x23kg suitcases, we got clever. This is the start of my display unit coming together. Onto the uprights go the shelves, which are added in order. The shelves are made of plastic covered foam (sandwich) board - this stuff normally comes paper covered, which scuffs and dirties easily, yet this plastic covered stuff was a real discovery. Originally we thought we'd buy sheets of corrugated plastic and cut them to size, yet when we discovered this stuff at the local printer, we knew we'd lucked out. They cut it to size and finished it for us (their finishing was way, way neater than we'd ever achieve on the corrugated plastic) with the whole lot (plus one spare shelf) costing less than we expected to pay for the raw materials. It's starting to take shape... did I mention that my custom built display unit weighs a mere 9kg (approx. 22lbs) including the crossbars and base? That's pretty suitcase and travel friendly, don't you think? 50% of it's materials are recycled, and furthermore, it is future-proof, in the sense that a) it is adjustable and/or can be added to and b) it will serve many more shows yet. The wall display consists of berets stretched over circular cut regular foam board to show off their intricate patterns at the crown. I had tried a number of different combinations of the circles ahead of time, but wanted to leave this part flexible. In the end I felt fewer circles were better and less cluttered. Nearly there... the circles were hung on monofilament (fishing wire) stuck to the back of the circles, but the environment in the conference centre unstickied every type of tape I had in my display kit, and some of that stuff is seriously sticky! In the end we also pinned the circles to the drapes, just to be sure. Almost there... the circular photos framing the outer edges of the booth are simply pattern photos printed on standard paper, cut, laminated, then trimmed again. This makes them ultra lightweight, glossy, and gives them a subtle frame. 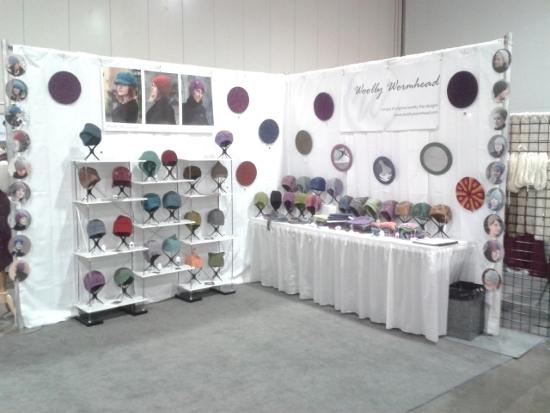 The display unit, complete with it's Hats... on the left are the Classic Woolly Toppers Hats, and on the right are the Twisted Woolly Toppers Hats. A side view, with the crossbars visible. Crossbars are crucial to making something like this work - the unit is itself is so lightweight that it really needs to be held firmly to stop it going wonky. There are neat little stacks of Hats there on the table - when I've exhibited over the last couple of shows in the UK, I've preferred to let the Hats loose on the table, as folks are more likely to wade in and try them on, which is something I actively encourage. The stacks (sorted by style) look much neater but hardly anyone went through the piles, let alone try them on, which was a shame. I'll be rethinking some of this next year. And do you see there, printed copies of CWT? I have previews! Or rather, I had previews... they've all been given out. Thanks again to Becky for taking shipment of those as I'd never have received them in time if I had to have them shipped here. 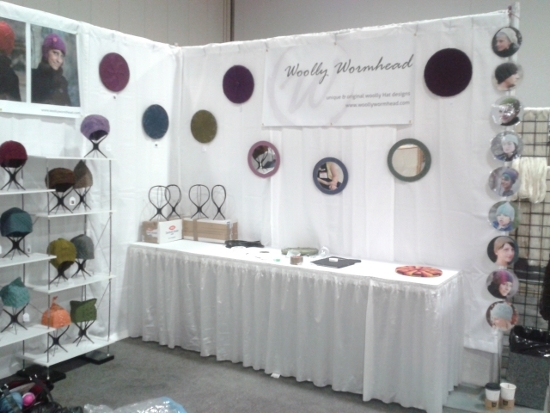 And there's me, in my booth, at the end of set up day! There'll be more blog posts to follow, I promise, once I'm feeling myself again. In the meantime, I'm going to sit outside, try not fade with the heat, and work away on some deadline knitting.